I remember listening to a song when I was young during this time of the year; as the new year began to make it's entrance, it caused me to reflect on the year that was escaping me. There was a sense of sadness and apprehension. Its as if the older I got; somehow if I missed something I would never be able to regain it again. Was there a task or an event that somehow eluded me? Did I miss participating in something grand with no opportunity to recapture that moment? Call it a whisper that spoke; life is moving quickly and you can't stop it. You're getting older; life is changing all around you. Perhaps it was a sense of evaluation but it was intertwined with trepidation. Time is ticking, the clock is moving and the calendar page I flipped read a new year. It was just yesterday, that I was 10 years old playing outside on the Bronx sidewalks; designing the concrete streets with my new found tool, soft, porous sedimentary rock-- o.k. chalk; riding bike and imagining that I was older as I played with dolls; opening fire hydrants (though it was illegal) and experiencing the joy of summer fun as we soaked in the sprinkles of city water. Adolescent, an unscripted time, never did I wonder about how quick life would unfold. Ok, I know this may be sounding somewhat odd. Perhaps you are saying, "Liz, it's Christmas and New Years, what are you thinking"? Come with me for this ride. As a christian and at the age of 51, let's settle something, I find life fascinating! It's a glimpse at my past with an exciting anticipation of what's yet to come. I'm expecting God to use me, aren't you? The world preaches a chosen "look"; a world wrapped in a marketing campaign that promotes a certain "you" if you want to succeed; even implying you can only flourish and thrive if you fit this "mold". Luke, chapter 2 unfolds the greatest story ever told. Did you read about Simeon? The Bible says that he was waiting for the consolation of Israel; revealed by the Holy Spirit, he would not die until he had seen the Lord's Christ. How old was he? Simeon's life had a purpose. A promise given to him and he saw the fulfillment wrapped in flesh with his own eyes. Did we quickly glance over Anna the prophetess, the eighty-four year old widow? I guess she could have complained and wondered why she had to have sorrow be her companion but instead she speaks of the redemption of Jerusalem; we also know that would be our redemption, Jesus Christ himself. Let's go back a little further. Abraham, a one-hundred year old man. A promise that included an offspring. Hey, this man is old and his wife, well she's up in numbers too. Did you say offspring? Forward, we see Zacharius and Elizabeth, John the Baptist parents, chosen by God in their latter years. An older couple with "no" possibility of having children, none-the-less the forerunner to the Messiah. God broke the mold. I'm seeing a picture here; God is not constraint by anything. My Creator is able to complete and bring to fruition the purpose of each one of us regardless of age, gender, status, rich, poor, failure, success or anything else that the world would like to box us in. The whispers of the world have no hold on us. John, the writer of Revelation had walked with Jesus as a young man. Persecution was a known friend to him. God revealed incredible truths that we read in the Scriptures; a future when the Lord would return and take home his Bride. The world exiled him only to have him escorted into a glorious revelation of a friend that sticks closer than a brother; into a world where the natural eye does not see; a fertile ground for the Spirit of God to encourage and breath hope into the life of one of his own. The older I get; every breath that God allows me to breath is another opportunity for me to see God a little more clearer. The steps of the righteous are ordered by God. That which He starts in us the Bible says he is going to complete. I'm no longer a little girl anticipating getting older. I am in the center of God's will waiting for the Lord to continue writing my life. With his very blood he has purchased me and his purposes are unfolding. Flip the calendar and I'll tell you what I see now; another opportunity to enjoy my God. I grow a little richer in the knowledge of his Word and every morning is an opportunity to experience something grand. When I was young, a little girl before I knew the Lord, my "life's journey" was what I could accomplished with my own strength and wit. As a surrendered, brought to life-believing child of God; I understand that life is an exciting expedition led by the Spirit of God. He causes life to come forth when the world would say it can't happen. He makes promises that he keeps. He's not concerned with my worldly status and actuality prefers to defy all "odds" for the glory of His Name! All my days are ordained and written in His book before I even one came to be (Psalm 139:16). 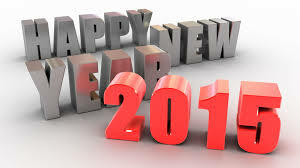 It is a Happy New Year! In my world there is nitrogen and oxygen in the outer atmosphere. I will never visit that realm. I'm surrounded in a quiet peaceful world; not gases but fluid encircles me. I've been made to bring enjoyment, causing even the youngest to admire me. In my quiet world it often takes a lot of ruckus to ironically create excitement. My first encounter in the hands of men came hundreds of years ago. Today I am still appreciated. I have the ability to change the atmosphere; the weather is transformed, altered at the moment you handle me. In my genesis I was pretty simple. Men have chosen to embellish me; lights, music, even causing their own faces to reflect off me. I don't mind if you grab a hold of me; toss me, shake my world and I will continue to bring you joy! 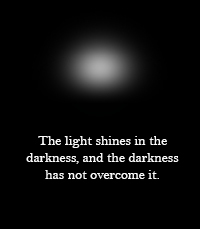 The light shines in the darkness, and the darkness has not overcome it. There was a man sent from God whose name was John. He came as a witness to testify concerning that light, so that through him all might believe. He himself was not the light; he came only as a witness to the light. The true light that gives light to everyone was coming into the world. He was in the world, and though the world was made through him, the world did not recognize him. He came to that which was his own, but his own did not receive him. Yet to all who did receive him, to those who believed in his name, he gave the right to become children of God— children born not of natural descent, nor of human decision or a husband’s will, but born of God. The Word became flesh and made his dwelling among us. We have seen his glory, the glory of the one and only Son, who came from the Father, full of grace and truth. Tuesday night; it's very warm; the sound of a beating heart is all I hear. I'm startled and I awake. Assuming there is something physically wrong, I attempt to walk to my bureau to check some of my vitals. I feel a coolness on my back. My eyes open and I see lights. Where am I? Slightly disoriented; I look around and realize I am on my bedroom floor, but how? I questioned for a moment if I was dreaming; but the reality my eyes conveyed said get up, you're in trouble. I managed to pull myself to my feet; I woke up my husband and said, "I don't feel good". The next thing I remember, I am on the floor again but this time with my husband and son next to me. It's a version of Ground Hog Day and I'm the star of this strange movie. I'm unconscious on my floor, in the darkness and I did not even know it until I awoke. Sounds familiar? For every believer that has gone from darkness into his Marvelous Light, you understand what I am trying to say. I walked this earth, lived my life and enjoyed all that was before me. Life is good. But, take the veil of my eyes; cause my ears to hear; awaken my soul and I see the LIGHT (1 Peter 2:9)! If God had not rescued me, I would not know what living really was. Salvation, a gift from my Father above. I blacked out twice in one night. This event was real! By the mercies of God I awoke; he put breath back in my lungs and I am overwhelmed by his goodness towards me. Everyday is precious. Can't take for granted the gift of life. The question is are we in darkness or in the light. May we not be like those who saw Jesus with their own eyes and denied him. Assisted by my husband and son, I'm back on my feet. I'm extremely exhausted and I'm taken to the bed to sleep. In hindsight I should have called an ambulance to be evaluated that night. I'm thankful, extremely, for God's mercy. I did follow up with a physician that evening. I was told I had an episode of Syncope. More test remain; I feel tired, but well; thankful I see the Light! I was recently remembering an incident that occurred in my family when I was about 10 years old. My grandparents lived in the Bronx in a 7 story project building. One evening an accidental discovery in my grandma's bed caused every member of the family to hover over her bed. No one could figure out this mystery. It seemed that jewelry if placed on my grandma's bed would begin to what seemed to slowly vanish. My dad, as he laid down to nap on my grandma's bed discovered that his gold bracelet was changing; almost evaporating as he watched. As we looked and inquired, including me, a young girl, items made out of gold were being consumed if placed on the bed. The discovery was so intriguing and yet terrifying; a costly side-show if you will. Gold is expensive no matter what era we live in. After exhausting all possibilities the police was called to see if the could solve the mystery. It almost seemed like a game; let's see if it will happen again, at the cost of someones precious gold jewelry. It was a secret, a riddle that no one could solve. We are intelligent people. What's happening? After a while, this little girl seems even afraid. Somethings eating everything; a monster, a ghost? Mysteries that seem to have no answer intrigue us, don't they? Why would God in heaven, send his son to die? Now that's a mystery! A mystery by definition is something unknown, obscure, a secret, perhaps something or someone unidentified? When God sent his son, though some think of it as a mystery, the truth is that God has been speaking to us for a long time. Go back and read the Bible from the beginning and there he is, Jesus waiting to be discovered; waiting to be announced to mankind dressed in flesh. Sometimes mysteries are just truths waiting to be discovered. My mom worked for a pen factory that laced it's product with a chemical element, atomic number 80, symbol Hg. Well if you know your science, the mystery's name is Mercury! Yep, one of it's properties is that it dissolves gold. I can't even imagine all the negative health affects that this scenario may have caused. Mercy God, mercy! That night, we began to understand what was happening. My grandma would come home from work and empty out her pocketbook on the bed covers. In her bag was a pen that her daughter, my mom, had given her. As the pen "leaked" mercury, the gold that came near it would be consumed. If you laid on the bed with gold rings or bracelets, you got it - they would be consumed. What a costly nap! Go back 2,000 years. This man that came in the flesh known as Jesus, the son of Mary is the begotten Son of God. No mystery, no hidden agenda. If you want to know him he reveals himself to you. If you call upon his name and cry out for salvation, there he is! Want your life changed, your sins forgiven; the God that seems unknown and far off reveals himself to you...to me! In the flesh, born in a manger. This indeed was a costly and extravagant gift. 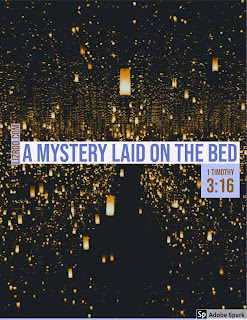 Unlike the gold we lost on my grandma's bed, this mystery wrapped in flesh cost us nothing! It cost him everything and he gladly came. Look again on the bed; the bed covered with hay, actually no bed at all but a trough in a smelly environment. It's the King of kings making his entrance for all to see; It's God himself in the flesh coming for all to experience the release of the burden of sin. Have gold, lay it by His bed. Bring frankincense & myrrh. This is the KING! He does not come to take but to give! The gifts we bring are out of thanksgiving and gratitude. He needs nothing except that those created in his image recognize and receive him. 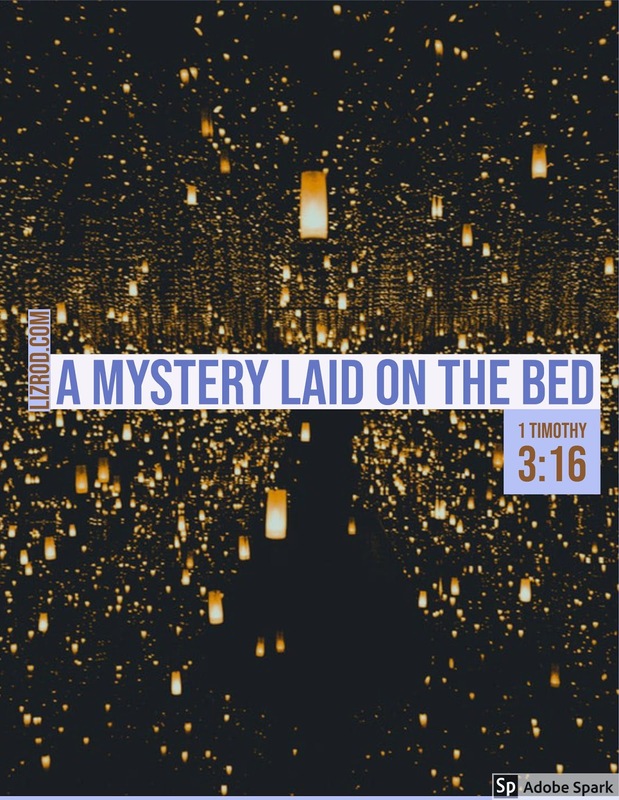 No Mystery, just a revelation that will change your life!